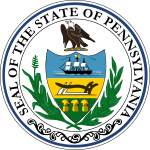 The 1974 United States Senate election in Pennsylvania was held on November 5, 1974. Incumbent Republican U.S. Senator Richard Schweiker won re-election, defeating Democratic nominee Peter F. Flaherty. In the general election campaign, Schweiker faced popular Pittsburgh mayor Peter Flaherty. Both candidates, as highlighted by a New York Times article, "[took] firm stands against inflation, recession, big spending by the Federal Government and abortion on demand." Schweiker, who was endorsed by the AFL–CIO, distanced himself from the Richard Nixon administration, specifically the Watergate scandal, by emphasizing his early calls for Nixon's resignation and the fact that he was on Nixon's "enemies list." In the end, Schweiker won re-election with 53% of the popular vote, with Flaherty winning 45.9%. Schweiker carried 53 of Pennsylvania's counties, a decrease from the 59 counties he carried in the 1968 election. Flaherty had a strong showing in Allegheny County, which contains his home town of Pittsburgh, which Schweiker had won in 1968. The final election results represented a political divide between the eastern and western portions of the state, Schweiker in the east and Flaherty in the west, with the exception of Flaherty's slim 4,491 vote victory in Philadelphia. ^ a b c Sundquist, Renée M. Lamis ; with a foreword by James L. (2009). The realignment of Pennsylvania politics since 1960 : two-party competition in a battleground state. University Park, Pa.: Pennsylvania State University Press. pp. 100–102. ISBN 027103419X. ^ "Statistics of the Congressional Election of November 4, 1974 [sic]" (PDF). Office of the Clerk of the U.S. House. Retrieved July 8, 2014.